BERLIN (Reuters) -- Germany's Finance Minister Peer Steinbrueck hinted on Friday that industries like carmaking could receive more government support. In an address to parliament, Steinbrueck said evidence showed the economic situation had "deteriorated dramatically." Steinbrueck said that every seventh or eighth job in Germany was dependent on automakers and it would be "fatal" not to support them when competitors in the United States are receiving billions of dollars in government aid. Germany has so far launched economic stimulus plans it says are worth some 80 billion euros ($104.6 billion). These include incentives for new car buyers, as well as investment spending and tax cuts. The government has put aside 1.5 billion euros to fund a program, which offers 2,500 euros to people who swap cars at least nine years old for new models. 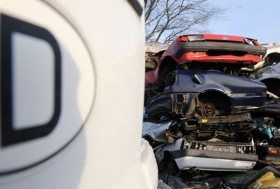 Matthias Wissmann, head of Germany's VDA automotive industry association, said the scrappage incentive could help maintain new-car sales at 3 million in 2009, about the same as in 2008. The German Finance Ministry said on Friday that the domestic economy is increasingly suffering from a decline in foreign demand and the global financial crisis shows no sign of ending soon. Germany, the world's biggest exporter of goods since 2003, has been hit hard by the global downturn. Demand for manufactured products has fallen sharply and a number of prominent firms have announced big cuts to production. The auto industry has been especially hard hit.